Are you ready to make classroom and behavior management struggle-free? What about elevating staff and student morale, retaining more qualified teachers, and saving your school and district money? Take a deep breath and look no further! I have designed comprehensive digital and vibrant live trainings that will help you, your teachers, and school de-stress for success! If you are interested in incorporating mindfully-based social and emotional learning tools and techniques into your school and classroom visit my Courses tab to register for one of our digital trainings or for a live training contact me by clicking here => Live Professional Development Trainings with Athea Davis. I’m an experienced educator that understands the many factors that affect student and teacher performance, success, and development. Based on my years of work with youth in public schools and the juvenile justice system, including many years of private youth and family sessions, I’ve discovered, through evidence-based research, that many of our interactions with youth and adults today are missing five key elements: presence, engagement, connection, compassion, and empathy. I designed a training that addresses these elements and the core of building a strong social and emotional learning platform for the individual and the community (the classroom and the family), mainly, cultivating strong cognitive and thinking skills, that students and teachers must have in order to achieve whole success. I offer 3 tiers of trainings that will take you, your students, and your school from just getting through the everyday (the daily struggles!) to individuals and a school community that turns struggle into opportunity and spreads the awesomesauce here, there, and everywhere! I train educational leaders and teachers on ways to incorporate mindfully-infused social and emotional learning tools and techniques in the classroom that are fun, practical, and relatable. 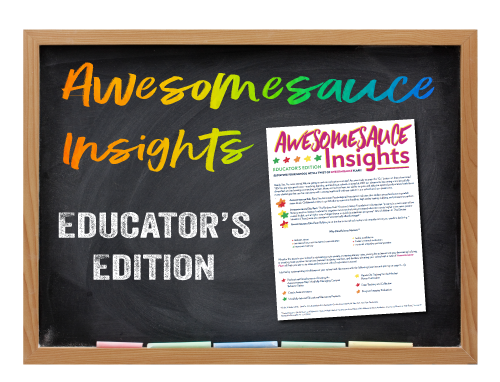 For more information on my live trainings + to access your free educational resources sign up for my Awesomesauce Insights: Educator’s Edition list below! As a new Sol Sense member you will receive exclusive health and wellness news and insights + mindfulness tips, tools, and resources to help you, your students, and school shine bright.